Dr. Rossello established his first practice in Columbus GA as Victory Vision next to Lenscrafters in 2009. After 8 years of building his patient base and serving the community, Dr. Rossello decided to establish Old Town Optique in September of 2016 in order to offer his patients better care. His goal is to offer the most thorough exam while using the most up to date equipment available. He has special interests in Glaucoma, Contact Lenses, Geriatrics, Pediatrics and Ocular Disease & Refractive Co-Management. Dr. Rossello has an undergraduate degree in Biology with minor in Sociology from Penn State University. 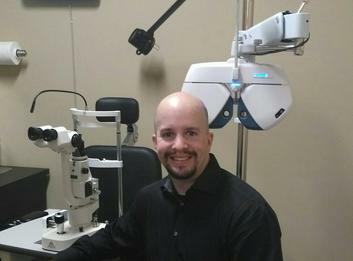 His desire to help people and interest in medicine led him to pursue a degree at Pennsylvania College of Optometry, where he graduated from in 2005. His training included special externships in pediatrics and low vision rehabilitation, as well as working at Central Illinois Vision Center after graduating through 2007. He was also given the opportunity to serve at an Indian Health Services Hospital in Santa Fe, New Mexico where he provided care to the Native Americans living in nearby Pueblos. His training experiences helped to shape his extraordinary attention to detail and caring nature towards his patients. In his leisure time, Dr. Rossello enjoys watching sports (especially football), running, listening to rock music, going to the movies and spending time with his family. More about what makes our eye care clinic stand out.